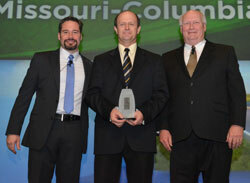 The Eye on Biodiesel Award winner for Innovation this year is Leon Schumacher. Leon Schumacher, University of Missouri, is one of the first researchers to jump into biodiesel with both feet was Leon Schumacher, a professor of Agricultural Engineering at the University of Missouri – Columbia. Dr. Schumacher led the first engine tests of biodiesel in the U.S. including a 1991 Dodge Ram which can still be seen on the university campus today. Biodiesel has become one of the most tested fuels on the planet. It began with this early research and continues today.